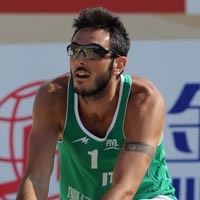 Nicolai has teamed Francesco Giontellato claimed SWATCH-FIVB World Championship medals in 2006 and 2007 for players under the age of 21. At the 2006 worlds for players under the age of 19 in Bermunda, Nicolai and Giontella placed second after losing the finale to Germany's Jonathan Erdmann amd Marvin Klass. Earlier in 2006, Nicolai and Filippo Belcecchi had placed 29th at the U21s in Myslowice, Poland. At the 2007 worlds for players under the age of 21 at Modena, Italy, Nicolai and Giontella captured the gold medal by defeating Adrian Gavira and Alejandro Rojas of Spain in the finale.